f course you’ll know that Hagrid kept an immature Norwegian Ridgeback dragon, called Norbert, in his hut for a while after hatching him, despite the fact that dragon breeding was outlawed by the Warlock's Convention of 1709. 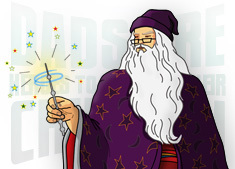 As a result, eventually, Hagrid was found out and had to give Norbert to Charlie Weasley, who worked with dragons in Romania, after he left Hogwarts. 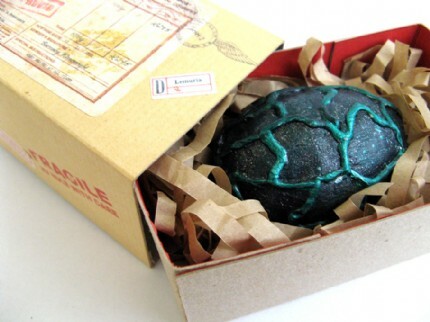 Dragon eggs are classified as Class A, Non-Tradeable Material by the Ministry of Magic. 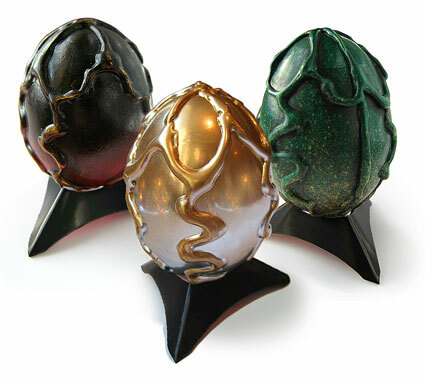 However, despite the ban, lots of dragon eggs still find their way onto the black market. 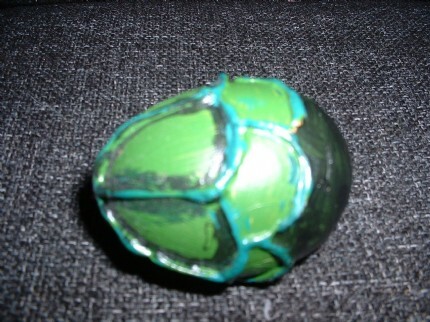 Chinese Fireball egg shells are highly prized as potion ingredients.
. . . Now you don’t have to steal a dragon’s egg, nor do you have to buy it on the black market, because you can make your very own homemade dragon’s egg, using the traditional art of egg blowing, a small amount of glue gun glue and a little bit of paint. 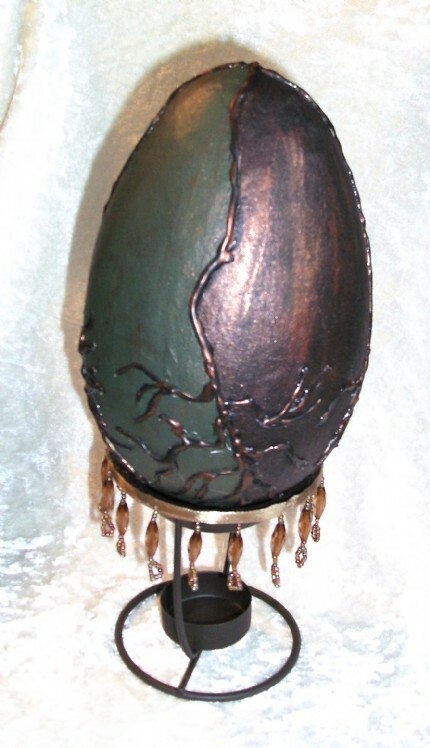 It’s really easy to get the most amazing effects.
. . . Of course, once you have made your Dragon’s Egg, it’s likely that you’ll also be needing a carefully crafted Egg Stand upon which to display your precious egg. Nothing could be simpler, dadcando’s original and authentic Egg Stand is the project you’re looking for. 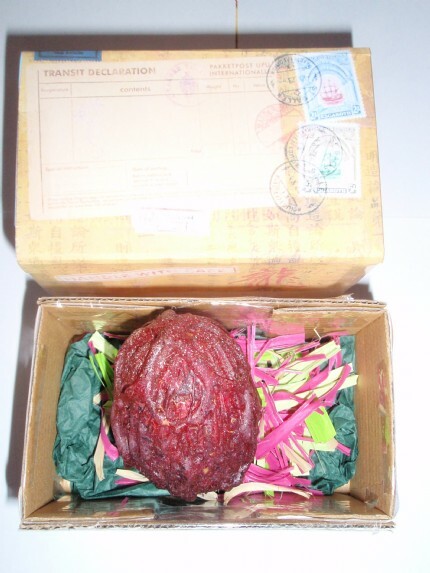 and then of course you'll be wanting a lovely Antique Mailing Box, keep your Dragon’s Egg safely in. The Antique Mailing Box project has all the instructions, templates and a great printable so that you can make a truly authentic looking box in no time at all. The download comes in both US Letter size and A4. 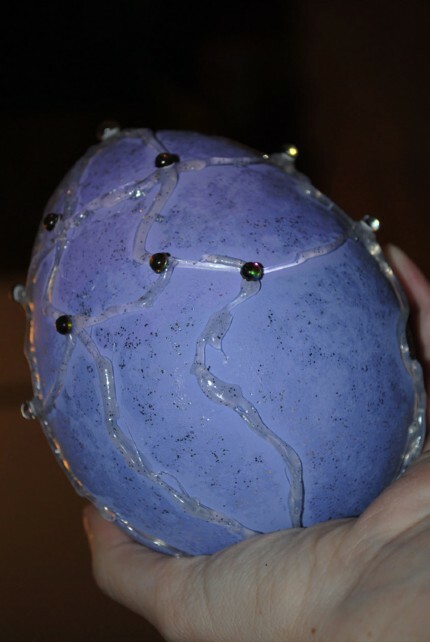 This download gives you simple pictorial instructions on how to make the Dragion's Egg. 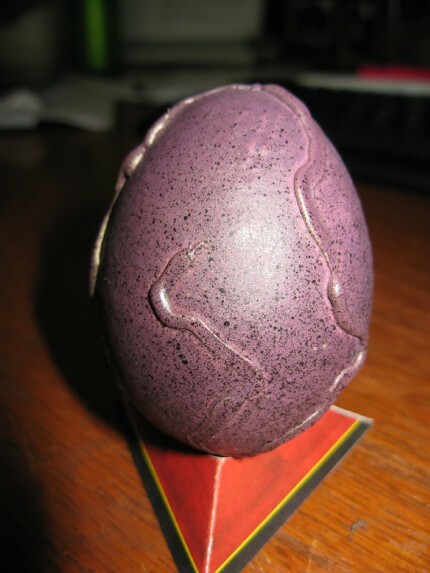 Posted by IsisOfSun - I based my egg's design off of the European dragon egg in Drake's Comprehensive Compendium of Dragonology by Dugald Steer. Posted by Glitchie - First off, this is my first project, and while I like how it came out, I have learned I hate working with glue guns because of the fact my hand is so unsteady and the part where I needed the glue gun came out uneven. 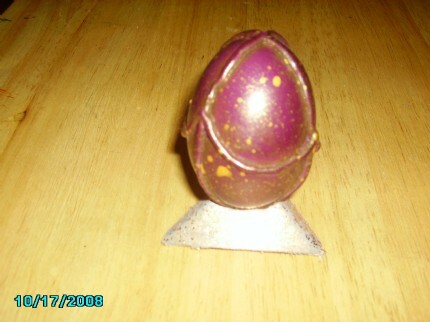 This egg was originally lavender when I picked it up at Michael's the other day. 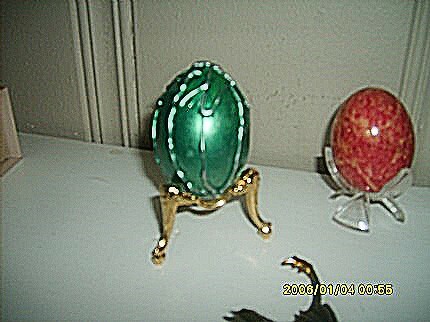 It is larger than a hen egg but I think I like the size for a dragon egg though I could have gone a size bigger. I used acrylic paint and painted it black to start because it had a number printed on it in black at the bottom. Then working my way out, I used a dry paper towel and dry napkins to get the texture on it. 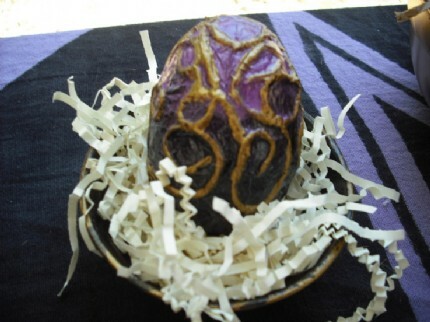 I had two shades of lavender for this egg as well. After painting, I used the glue gun, and then went over the glue again with silver glitter glue. As I patted it dry with a napkin, some of the glitter accidentally got onto the purple paint in between the glue designs. I liked the affect this had on the egg, so did it on purpose. As a final touch, to the glue design, I added some of multicolored self-sticking gemstones. 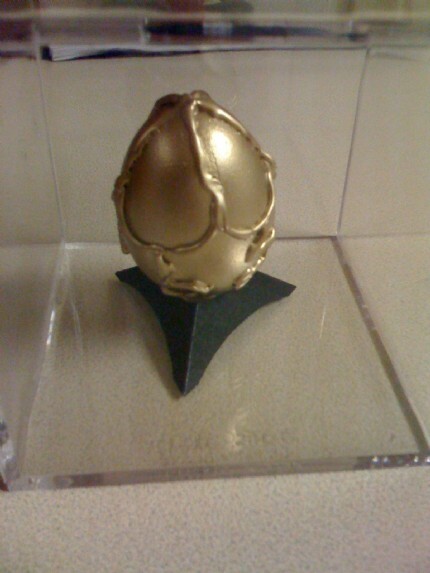 This egg is going to my niece in NY. I hope she likes it. Her room is purple, that is why I picked purple for the egg. I think my other eggs will be normal hen sized since it took so long to paint. 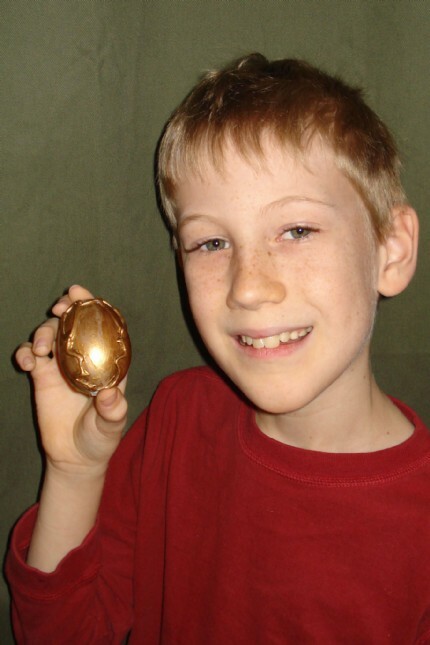 The picture is with the egg in my palm. 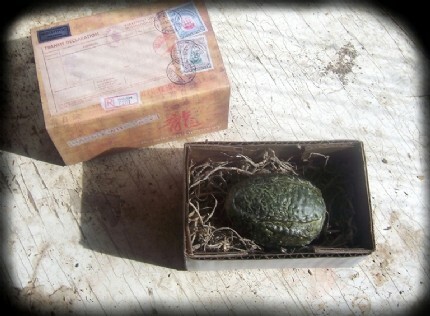 Posted by nepenthe - My daughter's 'Welsh Green Dragon's Egg' inside the antique mailing box. 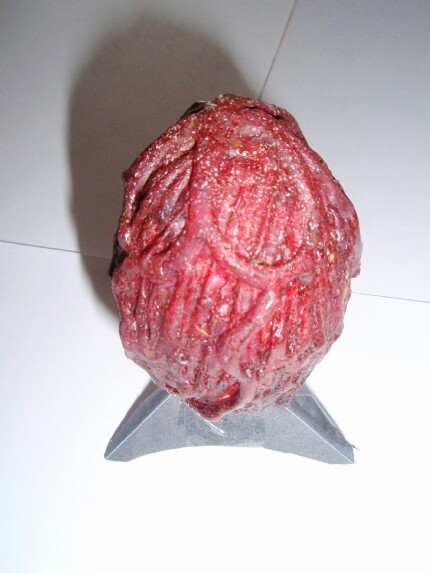 I used a styrofoam egg as the base, which was coated with sealer and tissue paper prior to adding the hot glue so that the foam wouldn't melt during application (had that happen before... not fun and very smelly!). 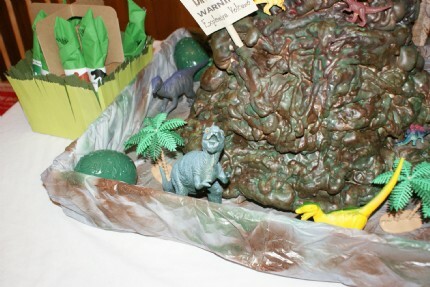 Posted by callmekelly - I made some for my son's dinosaur party and put them in with the volcano my husband made. 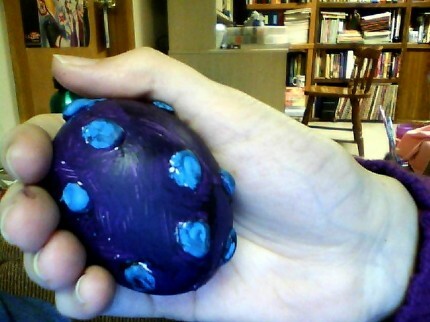 I just used Easter eggs and a matte finish paint. Everyone thought they were great. 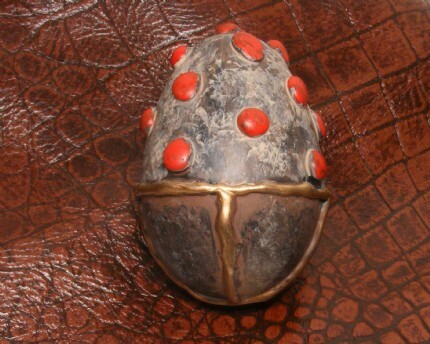 Posted by ravenswing36 - Here's a pick of one of my favorite eggs i did. 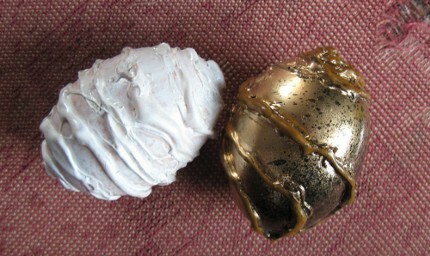 the 'nest' is actually a glass bowl spray painted inside with black and the outside with 24k gold spray paint. I used recycled paper that went through a shredder as the nesting material. 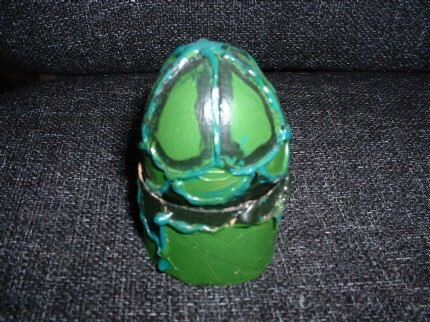 Posted by ravenswing36 - Instead of real eggs I used Plastic eggs that I picked up in 4 different sizes of easter eggs. 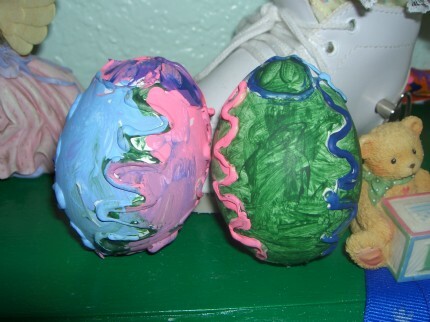 I took tissue paper and layed many layers across the eggs, just letting them rest as they wanted too. after getting it to the way I wanted, i took yarn and soaked it in the glue water mixture and layed it the way it looked right to me. Next came the painting and sealing. 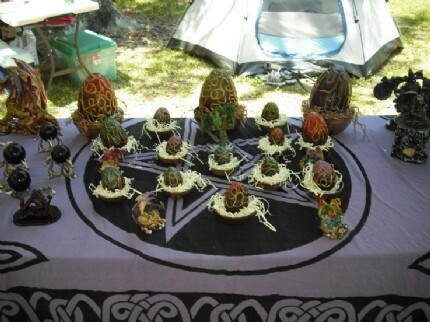 Alot of folks loved this since they look so fragial but when I toss and egg in the air and let it hit the ground, they are sold and want a dragon egg of their own! thanks for giving this idea! Posted by OmnivoreNZ - Simple drangon's egg. Cover cut from wine glass. Set on purple sand, on top of hard disk platter. Wife and daughter's versions in background. Posted by hedgehoggy - It worked out pretty well - this was the best one we made, with some nice mottled effects with the spray paint. Too bad you can't make out the gold highlights! 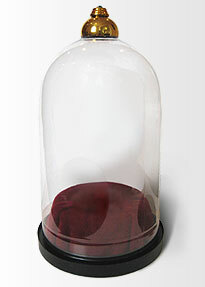 Posted by arguingman - I keep this little egg in a display case I found in the Container store, but now I'm going to try my hand at the bell jar project. 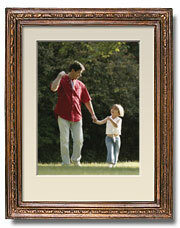 . .
Posted by dragonboy10 - This was my very first project from this website. 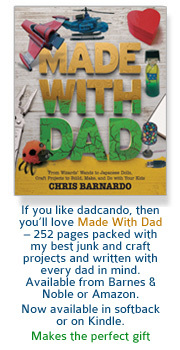 Since then I have made many more dadcando projects! 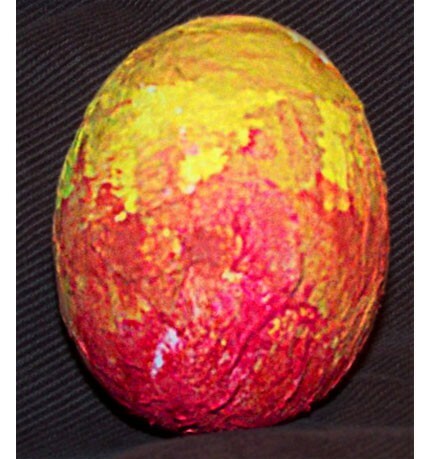 Posted by mustang2044 - Xtra large styrofoam egg from craft store covered in a layer of wood putty. 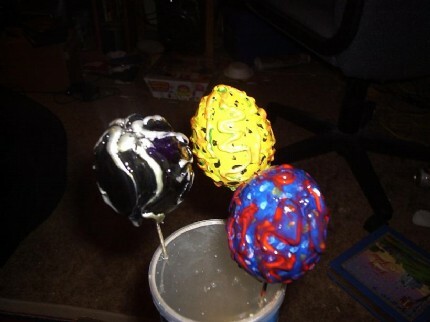 Let dry for a day sand lightly then hot glue gun and painting. I'm happy with result. 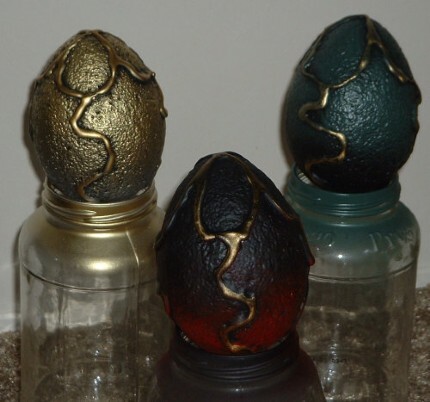 Posted by blazonsa - My two sons and I each decorated a dragon egg and you can see the three different results. Next we are going to make some larger out of paper mache around a balloon. Posted by jedififer - A little blurry but I have more. Used purple stained glass spray paint and a tooth brush to get the gold specks. 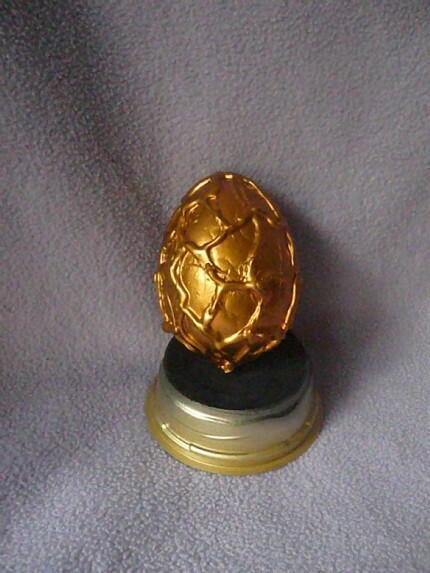 The egg stand is painted gray with gold glitter. Will have better pics of the stand with the stand turtorial. Posted by spacelioncomrade - I love drawing veins on objects. I just wish that the picture turned out better. 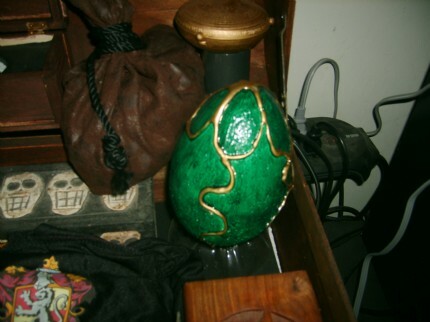 Posted by Christy173 - I'll be letting kids decorate some dragon eggs at my local Renaissance Faire this year. 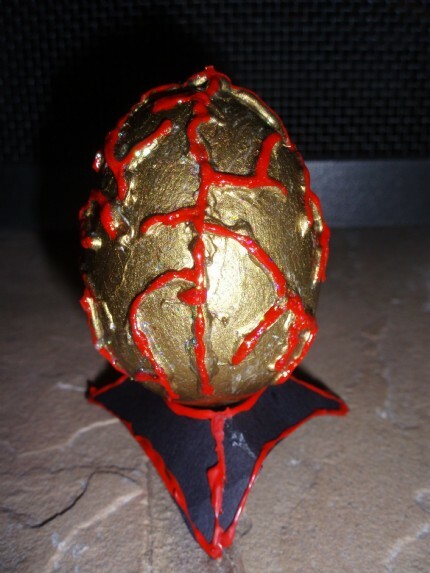 I'm also making some nice ones to sell, using paper mache' eggs. 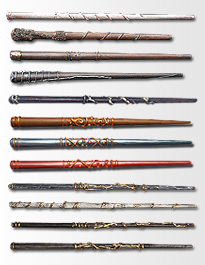 They're very inexpensive! 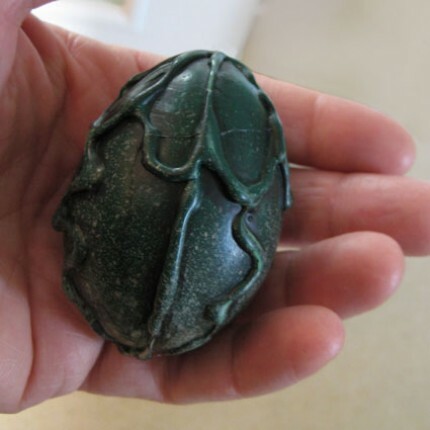 Posted by svhsmail - Giant dragon's eggs! 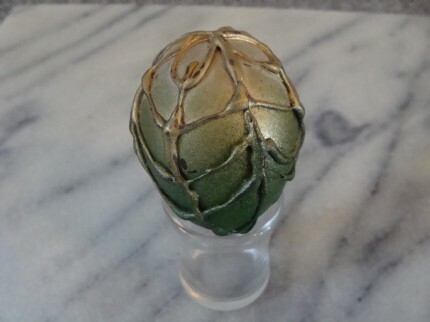 Posted by chris - I always wanted to do a egg blowing project, so that I could paint the egg, like I remembered doing as a kid, only when I cam to do it painting the egg was really difficult. 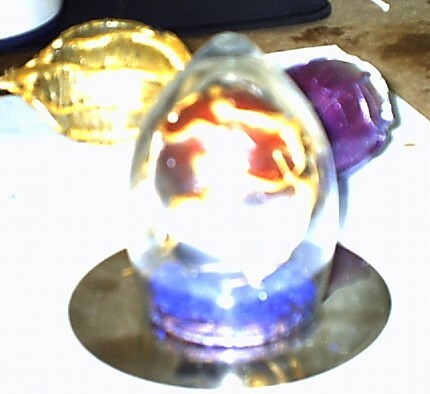 Perhaps I remembered wrong, anyhow, this project is much simpler and the effect is amazing, this egg and the red and gold ones I made look like the real thing and they were so easy to make.